Something tells me that to be disciplined, and to have meaning here - to be followed, to be watched to be read...I have to write something. Mostly, I write what moves me, I write "what matters," and the topics are things that flood in at some point - idle thoughts that I hear myself shape into something else - so I add them here. Right now, today, these days of late - nothing is striking me. And I know it isn't that nothing matters - it's that my vision is a little clouded with the one-two punch of unknowns and niggling fears. In the scheme of things - the grander scheme - I know I am being shaken awake. I took on, in my work, things so grossly not suited to me that they overshadowed the parts I did well, and enjoyed. The wrong bits accelerated the inevitable, and I lost my job. I am certain I am learning from this. And I am certain there is work out there to be done that I will do better. It is my responsibility right now to stay positive. To perk up, to take the steps I need for the Next Thing and to make home life, and writing life work. I need to be nicer to my Littles, to engage sooner and more fully. I need to look for a job, certainly, but the search can be far less stress-inducing than was the job, if I let it. As Pollyanna-ish as it sounds, I know for certain-sure that rolling around in the muck of it will not improve one itty bitty thing. Telling myself I had that in mind, I skipped a dinner last night with a steady, gentle group of friends who would have asked questions and added kind support. I wasn't in the mood. I didn't want to talk about me - because I say too much. And it bores me right now. And in retrospect, I know - of course I know - that I traded on the good bits of the evening, and the wine, the perfect mashed potatoes, and the laughter that also would have come. Because I wanted a little wallow and some navel-gazing. Alone. People around me help. And I will let them. And I will leave my belly-button as often as possible to glean knowledge and reach for different perspectives. So. As Agatha (the glue of the aforementioned group) says, quoting a friend of hers (who's prominent husband had died) - no pats, please. As Doris advised, I will take my occasional medicinal tequila shots. Only the good stuff. And I will find room and reason to laugh with my littles while no work to-do list looms. As Ali advised, I will take the funded trip to Florida and I will breathe in salt and sun. As Monsignor advised, I will send my resume far and wide. 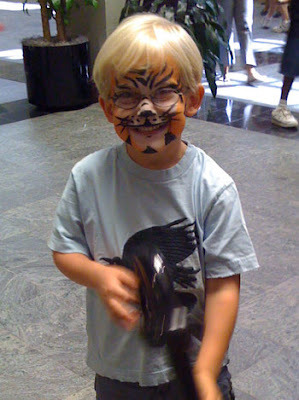 And as pPod would advise - it is time to paint on my tiger face and try my hand at conquering. I welcome - and request - any advice you may also have to add. He does give the best tiger hugs...grrrr. if your navel calls you--ask it for an interview and publish it--the navel KNOWS. Send postcard from FL, please. Love yourself right now.